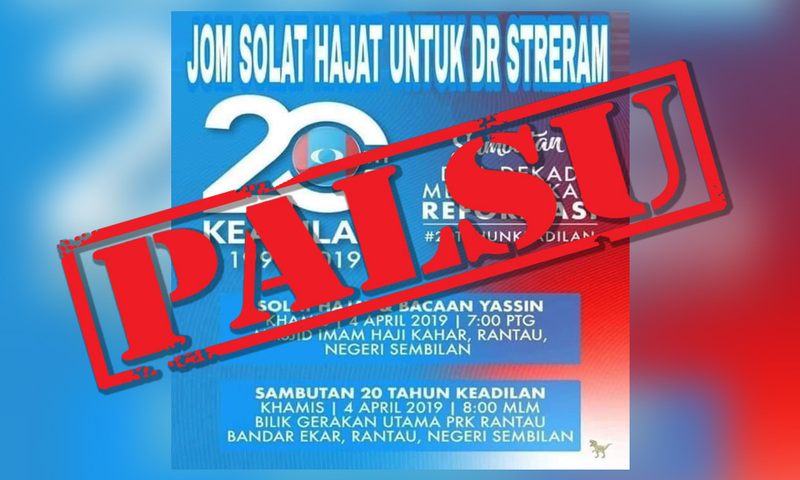 RANTAU POLLS | PKR secretary-general Saifuddin Nasution Ismail today dismissed as untrue a viral infographic on social media of a “solat hajat” and “Yasin” recital for Pakatan Harapan candidate for the Rantau by-election Dr S Streram. He said it was suspected to be spread by Umno-BN cybertroopers. "The infographic is aimed at playing with emotions and raising religious and racial sentiments that have long been the practice of Umno-BN and to mislead the people, especially the Malay voters in Rantau constituency. "It is also to confuse the members of Keadilan and the people who will attend PKR's 20th anniversary celebration at 8pm at Dataran Rantau today," he said in a statement. In this regard, Saifuddin, who is also the domestic trade and consumer affairs minister, advised voters in Rantau to not to be deceived by the false claims. The Rantau state seat by-election, on April 13, will see a four-cornered contest among Streram, BN's Mohamad Hasan and two independent candidates, R Malar and Mohd Nor Yassin.